지권인(智拳印)의 비로자나불을 본존으로 하고 좌우에 약사불(向右)과 아미타불(向左)을 배치한 삼불형식으로, 흙으로 제작한 소조상이다. 임진왜란 이후 17세기에는 대형의 소조불상이 많이 만들어졌는데 이 삼불좌상은 보물 제1360호 법주사 소조삼불좌상(玄眞 作, 1626년), 보물 제1274호 완주 송광사 소조삼불좌상(淸憲 作, 1641년) 등과 더불어 이러한 양상을 입증하여 주는 좋은 예이다. 이 삼불좌상은 규모가 매우 커서 보는 이를 압도하게 하는데, 인자하고 부드러운 얼굴표현과 허리가 긴 장신형(長身形)의 불신(佛身)은 매우 우아하고 품위 있는 불격을 보여준다. 특히, 오른손으로 왼손을 감싸 쥐고 왼쪽 검지 끝을 오른쪽 검지 첫째마디 쪽으로 뻗은 지권인의 표현은 명대 비로자나불에서 나타나는 수인(手印)이며 허리가 긴 장신형의 불상비례 역시 명초에 유행하던 표현이어서 명대 조각의 영향을 엿볼 수 있다. 이 삼불좌상은 조선시대 1633년에 작성된 귀신사 나한전낙성문에 1633년 이전에 삼불상이 만들어진 것으로 기록되어 있고 자수(子秀) 무경(無竟)의 에 의하면 절의 중건이 1624년이라고 하므로 1624년에서 1633년 사이에 삼불좌상이 조성된 것으로 추정된다. 귀신사 비로자나 삼불좌상은 17세기 전반, 명대의 조각양식을 수용하면서 이를 조선불상에 정착시키고 나아가 새로운 양식을 창출해 내고자 하였던 일면을 드러내 줄 뿐만 아니라 거대한 규모와 소조불상 조각의 뛰어난 기법을 잘 보여준다는 점에서 중요한 작품으로 평가된다. In this Clay Seated Vairocana Triad, the Buddha of All-pervading Light, is flanked by Bhaisajyaguru, the Medicine Buddha, and Amitabha, the Buddha of the Western Paradise. This is one of the large clay Buddha images produced during the 17th century after the Japanese Invasions of 1592-1598. Impressive in size and carving technique, it shows influences from the early 17th-century style of Ming China but also attests to the effort of Korean Buddhist sculptors to establish a new style of their own. The large statues, though overwhelming, have gentle facial expressions and long torsos, resulting in elegant and dignified appearances standing for the Buddha nature. 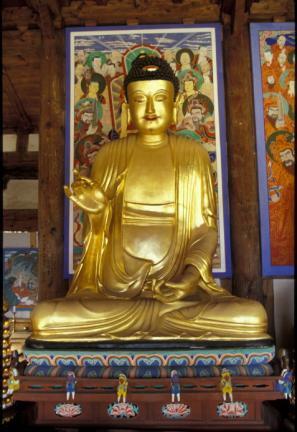 Particularly, the Vairocana at the center echoes the Chinese style of the Ming period in terms of its long torso and hand gesture symbolizing knowledge, called vajra mudra, enclosing the left hand with the right hand and stretching the left index finger toward the first joint of the right one. The dedication statement of the Nahanjeon Hall of Gwisinsa, dated 1633, says this triad was made before that year. 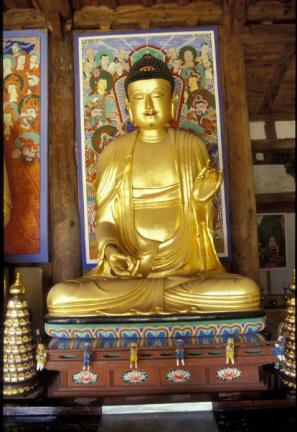 The temple underwent overall repair in 1624, according to Jeonju Moaksan Gwisinsa sajeok sain (Records of Gwisinsa Temple in Moaksan Mountain, Jeonju), written by Buddhist Monk Jasu (1664-1737). Hence it is presumed that the images were made between 1624 and 1633. 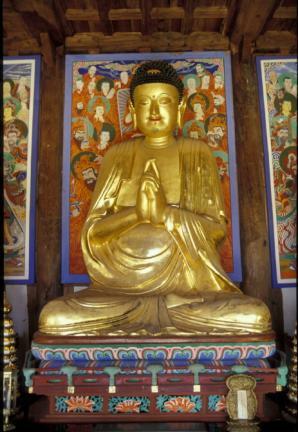 Also reflecting the trend of clay Buddha images of the early 17th century are two seated Buddha triads: one at Beopjusa Temple in Songnisan Mountain (Treasure No. 1360) and and one at Songgwangsa Temple in Wanju (Treasure No. 1274).